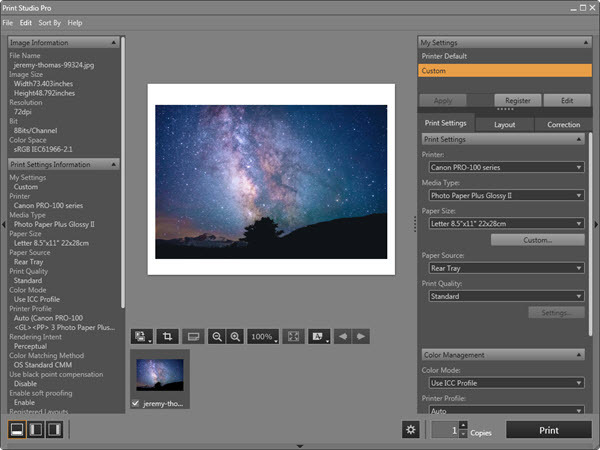 Print Studio Pro is plug-in software for Photoshop and Lightroom provided by Canon. It is primarily for quick print jobs and has limited layout ability. In addition, there are controls for three types of color management as well as color correction. 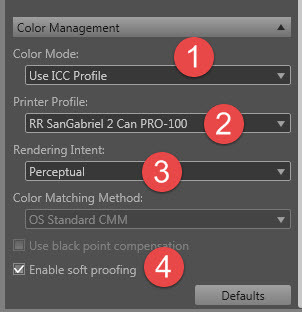 This article focuses on how to use Red River Paper's ICC printer color profiles with Print Studio Pro. These instructions are valid for Windows and Mac. The screen shots are Windows. 2 - Set the media type, which you will find on the profile instructions use PDF that comes with each profile download. The Red River Paper product you are using will not appear in this dialog. 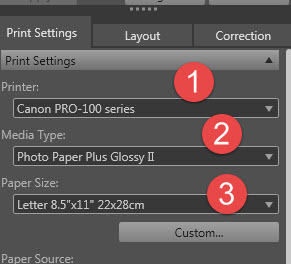 3 - Set quality to level 1 and click OK.
2 - Choose the profile for your paper and printer. This drop down menu will show you all profiles installed on your computer. You will likely need to scroll up or down to find your profile. They are usually arranged in alphabetical order. 3 - Choose a rendering intent. Most customers use Relative Colorimetric with success. We strongly encourage you to experiment to see which you like best. Click here for more information about rendering intents. 4 - Enable soft proofing attempts to show you the affect of a color profile. In this case, it will give you a general idea of how your paper will affect the print. 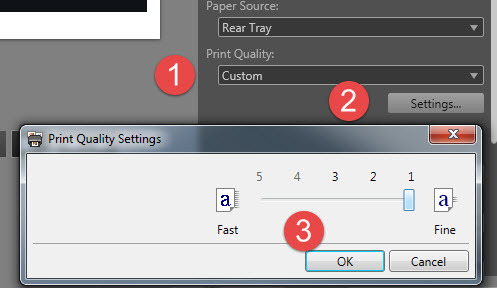 Using this feature will not alter actual print quality. Go back and verify all of your settings. When you're satisfied with their accuracy, click the PRINT button at bottom right.